Jerry Taylor passed away July 17, 2017, at age 70 from pancreatic cancer. He was an enormous force for good in the field of evolutionary medicine, and a wonderfully creative, critical, and energetic Associate Editor for the Evolution & Medicine Review. He is survived by his son Linus, and his wife, the actress Barbara Flynn. After the book came out, to wide appreciation, Jeremy and I talked about his possible contributions to the EMR. I thought he might write an occasional article, but soon he was writing eloquent essays twice a week, bringing new insights to the entire community. Readership rose sharply. He wielded his critical faculties firmly but gently. He was a consummate editor. I asked him if he would like to become the Editor. In typical modest fashion, he said no, he thought it was better if he just continued as the Associate Editor. However, he kept coming up with great ideas for how The Evolution & Medicine Review could become more interesting and more useful to its readers. In my last Skype with him just a few weeks ago. he was full of new ideas and eager to write more for the Review despite knowing his prognosis was grim. He loved the Evolution & Medicine Review, and it joined with his intelligence to infuse his many posts. Some people you just plain like and admire and enjoy spending time with. Jeremy was one of those. His curiosity and wide range of knowledge and good humor made him someone everyone wanted to be with, and someone who will be missed very much by all who know him, and even by many who know him only through his prose. For those in London, here will be a celebration and cremation on Monday 7th August at 2pm prompt at St Marylebone Crematorium. Donations made in his name to the UCL Hospitals Charity. fund. will go straight to the lab of Professor Charles Swanton (The Crick Institute and UCLH) whose team is focusing on the cancer that killed Jerry. Thanks to Holly Smith who provided a copy of a lovely little 1947 article in The Interne, by Ashley Montague titled, Anthropology in Medicine. 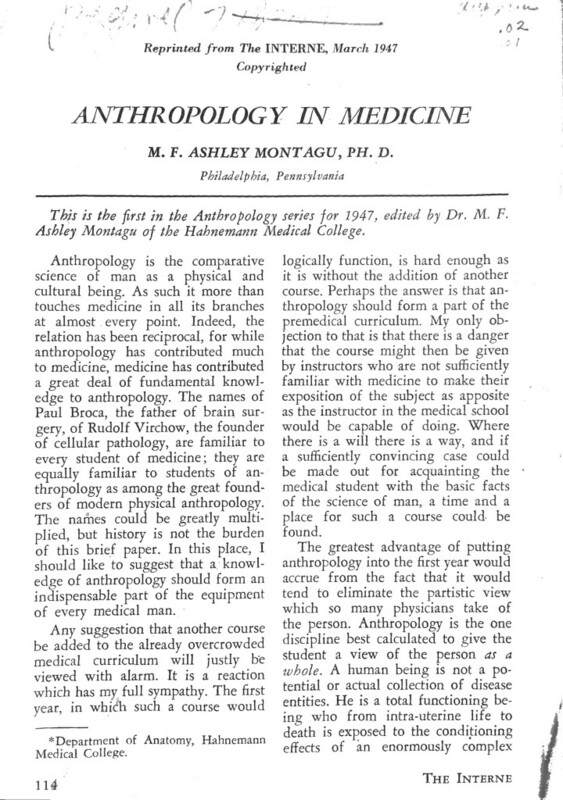 Some quotes offer crucial historical perspective, such as: “Any suggestion that another course should be added to the already overcrowded medical curriculum will justly be viewed with alarm” He goes on to suggest that an anthropological perspective is crucial for physicians to have a view of the whole person in context, and to recognize individual variation as intrinsic to science and medicine. Click here for the full pdf. Slower aging for human populations with lower extrinsic mortality? 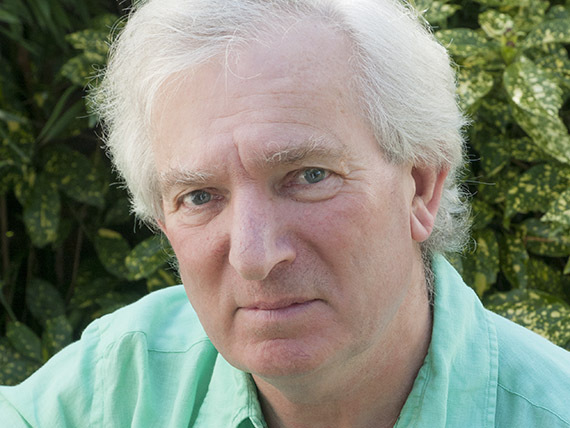 An article in the April, 2009 issue of Evolution, offers provocative support for George Williams’s 1957 prediction that decreased extrinsic mortality rates will select for slower rates of aging. The article compares data from subsistence and European societies in the past 200 years, and concludes that selection may have slowed aging rates in just 10 generations, and it may account for differences in aging rates in different populations. The multiple measures of aging rates are a strength of the article, but they also add complexity that makes interpretation of the results challenging, as the authors note. Has Actuarial Aging “Slowed” Over the Past 250 Years? Williams’s 1957 hypothesis famously argues that higher age-independent, or ‘extrinsic,’ mortality should select for faster rates of senescence. Long-lived species should therefore show relatively few deaths from extrinsic causes such as predation and starvation. Theoretical explorations and empirical tests of Williams’s hypothesis have flourished in the past decade but it has not yet been tested empirically among humans. We test Williams’s hypothesis using mortality data from subsistence populations and from historical cohorts from Sweden and England/Wales, and examine whether rates of actuarial aging declined over the past two centuries. We employ three aging measures: mortality rate doubling time (MRDT), Ricklefs’s ω, and the slope of mortality hazard from ages 60–70, m′50–70, and model mortality using both Weibull and Gompertz-Makeham hazard models. We find that (1) actuarial aging in subsistence societies is similar to that of early Europe, (2) actuarial senescence has slowed in later European cohorts, (3) reductions in extrinsic mortality associate with slower actuarial aging in longitudinal samples, and (4) men senesce more rapidly than women, especially in later cohorts. To interpret these results, we attempt to bridge population-based evolutionary analysis with individual-level proximate mechanisms. JAMA published two articles to commemorate Darwin’s 200th birthday. Early Bird Rates until Sept 9th, register online!